I'm also fairly sure that "Viam Inveniemus Aut Faciemus" means "We will find a way or make one". making it glorious and great." clue=V. Staging Area:  New York City, NY. of godliness and honesty, let him be protected." clue=Hooked up with my MIT Lincoln Laboratory conektun. b. January 28, 1833. d. January 26, 1885.
also moved from Khartoum to England. clue:  This is going to be a long note, so hang in there. several ads, the address 475 Riverside Drive in New York is mentioned. I. 1984 coordinates (perhaps a meeting place) Monrovia, Liberia. over (or establish a new community), and make it grand. whatever those two cities metaphorically represent. IV. And they expect their dominion to last a long time. that this time they expect to win. power." Sorta fits, doesn't it? IX. Incept ... They'll get started Feb. 1, Deo Volente, God willing. forces of nature. Who knows? they were talking about at the beginning. last hundred years. That fits with the interest in San Francisco. Riksbank. After a lengthy voyage she arrived at False Bay, South Africa in late May 1783, continuing her journey on July 10th. following day, in rough weather, ^�Nicobar^� ran onto a reef near Cape Agulhas, South Africa; 11 of 36 aboard were rescued. you're doing it most people don't realize what is happening. clue:  Monrovia, Liberia = 6.18N 10.47W !! The earlier clue is incorrect. ...disagreeing (again) with earlier clue. 1. "Greenwich Mean minus one" - AZ does not participate in Daylight Savings Time, does it? 2. Hebrew in IV - do we have a translation/reference? 3. Latin intro (Viam...) - do we have a translation? 4. Am I the only one who wonders about the symmetry of the coordinates: 30.03 and 40.40 ? Central Europe, parts of Africa are all I hour in front. Reply to jules 11 Apr 03 re GMT. Greenwich mean Time is more correctly called Universal Time or UT. stipulated in another page? GMT hours may refer to units of 15 degrees. This does not make sense though because the "staging area" in V is a place which links with the 475 clue. Sqq. by the way is a naval sonar device. re.clue from Beacon - sqq. next, giving - "'84 coordinates as per the following"
mayday ad? D'you think there may be some still mission Bryan? The date of this ad was the 20th anniversary of the assassination of JFK. "Atlantis" near Cape Town. Cheops, Chephren, and Menkaure are all near the top coordinates, I believe. Hey Bryan! Jake here, we met at your office yesterday afternoon. May Day ads, but at least in the early ones (Nov 22, 83, Sept 13, 84, Mar 15, 85) have a lot of references to future ads in them. 15 85 see it as well. "84 transmissions as per coordinates"
Followed by some "1984 coordinates". no Wildcat issue for 6/20 because it occurs between class sessions. Perhaps a more "northern" newspaper got the ad. IV. Schedule: "a time, two times, and half a time"
In the clue by cynic, the quote mentions 1290 days. This is roughly 3.5 years, or one plus two plus one half. Looks like I'm 20 years late on this one, but what the heck. years, instead of days. meaning that they plan to work for the end times, something weve seen in teh newer ads. responsible to god, and installed those likeminded. again, a theme in the way the orphanage thinks. "neocon". heres a little history http://www.lewrockwell.com/north/north180.html. the pattern of who fits very well. its not a very comforting thought. during the times in question. NOTE: this is the first clue that has any 'real' quantity of text. "North." I'm assuming up in Illinois, as that shows up in other announcments, but I have yet to find it. by which all announcements are constructed/ or derived. correct, this would narrow the quote down. York Times may be a possibility - if the date falls between class sessions over there then it's unlikely to have been a Uni paper. through the word and idea of 'necessity' - therefore, the binary zipcode may indeed be the (initial) 'operational area'. Khartoum is also referenced Aug 24/81, Sept 13/85 - at least. This makes 3 in the very early ads. Pennsylvania, where the Hannibal quote is on the Gate? State Hwy 27 and Race Track road, hmmph.) Maybe some hidden agenda for mis-representing the format? elaborate prank by some well-to-do schemer. A jolly good bit of amusement I dare say! It'd be interesting to know what was happening in Liberian politics and intrigues in 1984.
is there something like Daylight Savings Time or BST in Liberia? with many such places, 'Service Organizations' can operate with great autonomy if the right locals are satisfied. "sqq" is a bibliographic abreviation for sequential or sequence isn't it? So might that make it "as per coordinates sequence(s)"? fictive. A lot of people did go native in one way or another. nations than many other locales, because they're often instable anyway...y'know, like Liberia. recall that the Berbers were involved somehow (are there Berbers in Liberia?). Also, the Ark o' Cov is supposed to be in Axum Ethiopia isn't it? Hmm. (and not get cholera?) until the wicked get broiled at the EOD. stumbled upon that cuneiform image is remarkable! See if gematria works for the Greek alphabet. Search the Internet to get the correct numerical values for the Greek letters. thing. Real theology of paradox because it  is simultaneously prosaic and throat-cutting radical. "Kitchener quite possibly prevented war between France and Britain when he dealt firmly but non-violently with the French military expedition to claim Fashoda, in what became known as the Fashoda Incident." "He ordered the mosques of Khartoum rebuilt and instituted reforms which recognised Friday - the Muslim holy day - as the official day of rest, and guaranteed freedom of religion to all citizens of the Sudan." "The British, on the other hand, wanted to link their possessions in Southern Africa (modern South Africa, Botswana, Zimbabwe, and Zambia), with their territories in East Africa (modern Kenya), and these two areas with the Nile basin. Sudan (which in those days included modern day Uganda) was obviously the key to the fulfillment of these ambitions, especially since Egypt was already under British control. This 'red line' (i.e. a proposed railway, see Cape-Cairo railway) through Africa is made most famous by Englishman and South African Political force Cecil Rhodes, who wanted Africa 'painted [British] Red'. When one draws a line from Cape Town to Cairo (Rhodes' dream), and one from Dakar to the Horn (the French ambition), these two lines intersect somewhere in eastern Sudan near Fashoda (present-day Kodok), explaining its strategic importance." "It was Rhodes' dream to build a railway from the Cape to Cairo and to have every Africa country along this route under British control." And the trail of metaphor comes full circle: 'Rhodes' : 'Rhode Island'. Re: leaking pen & "the end of the world"
It can mean both, I'm not sure. To the product, Products and a Half. I can only really pipe in on the Hebrew of IV, since I'm new to this little mystery of life. "moarim" (spelled with an ayin) in my Hebrew dictionary, probably because it's a dictionary of modern Hebrew. Notably, I didn't find moer by looking up "time", either. It looks like an agent noun, if someone has a better dictionary than I. "For a moer, moarim, and a half." Just about exactly what the English says. I'll try to translate what I can of these. Something plain: "a time, times, and half a time" is glossed in the Oxford Study Bible as 3.5 years, which is about how long it takes--wait for it--for someone to finish law school. Or maybe undergrad, if they're motivated; but U of Arizona..."come on" in a Phil Leotardo tone. referenced by its initials �ADW�, so perhaps the northern source is referenced in a similar fashion. 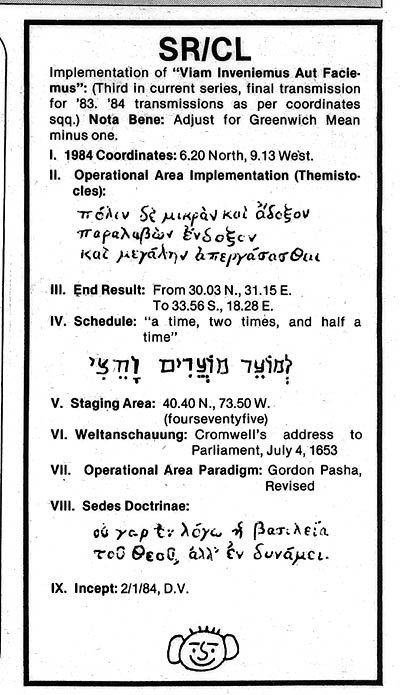 3) Many times the coordinates for upcoming announcements are preceded by �Vide, ADW� (see 3/15/85). publication in which the announcements occur (Vide being shorthand for Vidette). see if there are more announcements, we might get another piece of this puzzle. Regarding actionlog's comment: "Weltanschauung" is not a Nietzschean concept. certain, as I don't know enough German to check primary sources. I welcome correction. stood for 3 and a half years. a time being 1 year. into reputation, shall be found to be of great service, and ! Here is a potentially significant event in south Africa in 1983. South Africa, which has been in force since 1997.
in favour of the new constitution. 1. This is the last �episode� of a series of three riddles. �Find a way� was something that grabbed my attention. Maybe this is what we are supposed to do? Find ways, streets, roads? jungle, pure jungle. But as you can see on google-earth there is an S-shaped road exactly where these coordinates are. Maybe this road has a number or a name? II. I have no idea, where that sentence took place, maybe on a certain street? VI. Maybe it's the street from Cromwell's address to the parliament? I wasn't able to find out where Cromwell lived. us the way to through another enlightened movement. people to know where they are going to meet. these older Maydays for historical references. A great help is a russian site someone has tried to decode each segment of each message.